I first met producer, Mark Moseley in 2002, when he produced my first Nashville album, “Dogwood Place”. I contacted Mark in 2010 who agreed to produce two more albums in the summer of 2011. 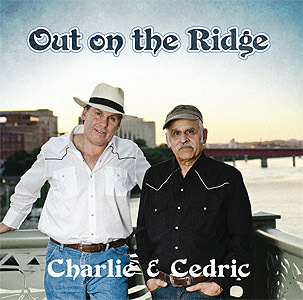 “Out on the Ridge” is a joint album made with my old friend and bluegrass mentor, Ced Thorose. I wanted to maintain the aim of recording original material. I wrote six of the songs, Ced wrote the four instrumentals and we co-wrote two songs. As with Dogwood Place, Mark managed to bring together a stellar cast of bluegrass musicians including guitarist Bryan Sutton, fiddle player Aubrey Haynie, banjo player Scott Vestal, mandolin players Adam Steffey and Andy Leftwich and the two most respected bass players in Nashville, Mike Bub and Dennis Crouch. Mark’s studio was in the process of being refurbished so we recorded the main tracks at Ricky Skaggs’ Studio in Hendersonville and mixed the tracks at Mark’s second studio. We then had Ronny Light, who was the chief engineer at RCA for many years, master the CDs. Working with musicians of this calibre is always a thrill and Mark has all the qualities you need in a producer: he has technical knowledge, great ears, great ideas and is a fantastic musician. It is really an extraordinary privilege to be able to make an album in this way and I am pleased to say it exceeded all my expectations. “This is terrific” – June Williams, KHBW Radio, USA. “One of Charlie’s best” – Stuart Cameron, CMR Nashville, UK. “Great, excellent production” – Marie Crichton, BBC Radio Shropshire, UK. “Top quality as always from Charlie” – Erwin Schapendonk, Centraal FM, Holland. “Excellent” – Alex Pijnen, Zuidwest Radio, Holland. “Superb” – Urbain van Geerteruy, Radio Beeiard, Belgium. “Stunning record, this is exceptional” – Ros Ray, Forest FM Radio, UK. “Charlie seems to have perfected a top bluegrass sound” – Allan Watkiss, UK Country Radio. “Excellent” Kurt Gabriel, Radio Theben, Austria. “One of Britain’s best in the world of bluegrass” – Ray Grundy, Metro Radio, UK. “A pure delight – proud to play ‘Real Country Music’ again” – Tom Robinson, Kingstown Radio, UK. “Super British country music” – Doc Schulze, Radio Eurohertz, Germany. “Traditional country music doesn’t come much better than this” – Friedrich Hogg, Radio Free FM, Germany. “Clear voice, very good backing, great lyrics” – Brian Lewis, Hobart FM, Tasmania. “A lovely record” - Ann Hinder, Southern Country Magazine, UK. “A most enjoyable effort” – Michael Schroeter, Radio Herford, Germany. “A brilliant antidote to the rock that passes for country these days” – Arno Beirings, Eagle Radio, Holland. (c) CHARLIE BOSTON 2019. ALL RIGHTS RESERVED. REPRODUCTION OF THE MUSIC, IMAGES, AND CONTENT ON THIS WEBSITE ARE PROHIBITED.